Good morning MONDAY!!! What's your morning like so far? Mine has already turned a bit nutz, I'm locked in the bathroom typing this out for its the only place of privacy at this point! Brooks woke up at 5:45 wouldn't go back to bed, screaming cranky children, cereal bowls crashing to the ground, technology failing to cooperate, yadda, yadda, yadda, all before 7am,the usual, right? Thank goodness for a quiet 10 minutes to pull up a chair, your hot cup of tea/coffee and enjoy this Monday Morning Book Club summery from BreAnna over at MomBeyondMom. She's created a pretty helpful place full of tips, recipes and reviews for every moms enjoyment. After the Book Club head over to her blog and check her out. Hello friends! 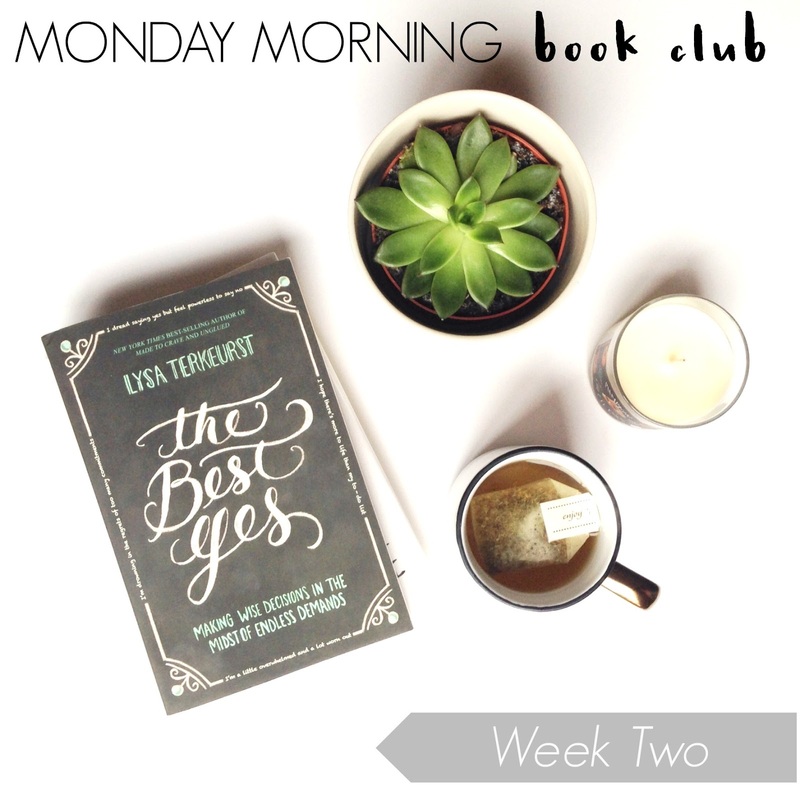 I'm so excited to be this week's guest blogger for our review of The Best Yes, by Lysa TerKeurst. I will be reviewing Chapters 5-7. For those of you who don't know me let me introduce myself. I am BreAnna from MomBeyondMom, a blog about everything mom and beyond. I am a mom of two colorful girls, have the most amazing Mr and recently started my blog business which I am absolutely loving. To say I am busy, is an understatement. I am constantly being pulled in a million opposing directions. I start most days with an agenda and plan, but through out the day new things get piled on and it feels as though I am constantly tackling the ever growing list of things "to-do." There has to be a better way. Right? There is, and this book has been such a blessing to me. Especially during this season of my life. I don't want to look back and realize I missed God's calling, God speaking to me or even present time with my family because I was constantly tackling my list. I am so excited to embark on these next couple chapters to learn a few practical ways in which I can scale back and learn what is truly the best-yes for me and my life. In Chapters 1-4, broken down by Kelsey of The Home Loving Wife, we came to the realization that having an overwhelmed schedule can lead to an underwhelmed soul. And let's face it, nobody wants that. Let's take a look at Chapters 5-7 and see if we can't come up with some ways to figure out what our best yes is!! Chapter 5 starts off with Lysa retelling the story of her struggling with the decision of whether or not to allow a friend to stay with her and her family. As she starts telling the story, I begin to feel like I am watching myself. In life I have always struggled with doing what I think "I should do" versus what I truly want to do or what I can handle. She goes on to explain that doing what you feel you "should do" leaves you with a very overwhelmed schedule, and I couldn't agree more. To me the feeling of letting someone down or feeling as though I am not helping when I technically could, feels terrible. I would give of myself until I had nothing left. While I suppose that is a great quality, it often times leaves me feeling very depleted and my soul underwhelmed. Once I began to have children and became a stay at home mother, this feeling only multiplied. I felt as though I had to be everything to everyone at all times. This usually left little to no time for myself. This is not a good recipe. Throughout the years I have learned that I have got to take care of myself and not put too much on my plate, otherwise I end up a wreck. And lets face it, if I am a wreck I can not take care of anyone else. 1. Can this phsycially fit into my life? 2. Can this financially fit into my life? 3. Can this spiritually fit into my life? 4. Can this emotionally fit into my life? "Whatever I do. In word or deed. My approach must honor Jesus." Meaning that everything you do must align with a Godly spirit. And if you honestly answer each of these questions you will be well on your way to honoring God and discovering what your best-yes is. So now you have made this decision that you want to make better choices for yourself. You have learned a few tools and questions to ask yourself when you are presented with a demand and once you do that you will be able to give the best-yes. But now what? How do you make this happen? You chase it down. You constantly pursue. Nothing happens overnight, but you make small changes here and there and suddenly you have paved a way for change in your life. Lysa says, "Show me a decision and I'll show you a direction," meaning that every decision you make helps shape the life you are living. If you keep using your tools/questions when you have to make a decision you are going to continue to keep choosing the best yes. And eventually, before you know it, it will be a habit for you. A habit to always choose the best-yes. With all that being said, I think it is important to remember that there is no such thing as a perfect decision. There will always be pluses and minuses. You have to take the good with the bad. We will explore that more in Chapter 7. Lets take a look back to previous chapters where Lysa describes the agony she goes through when making the decisions and tries to understand why it is so hard for us to make decisions at times. One of the main discussions in Chapter 7 has to do with fear and its paralyzing abilities. We fear we will make the wrong choice, so we try to avoid making one. That in itself is letting fear win. We have to remember that "failure is an error, NOT an end." We have to understand that with every decision we make there will be some negatives that come along with it. There is no such thing as a perfect decision, only a best yes decision. Throughout the chapter she talks about five ways we can make a decision without letting fear have an effect on our decision making process. Trusting in God by placing my desire under his order: If you trust God, there is no room for fear. You must understand that no matter the outcome, good or bad, God will use this for your journey. Every single "failure" has and will shape the person he has meant for you to become. Analyze the decision: Decide what is best for you. Use the tools we have learned in the previous chapters to decide what is the best yes for you. Make the decision: You have the tools. You have asked yourself the questions. Now you have arrived at the best yes for you. Pull the trigger, make the decision, do not let fear keep you from making the decision. Own the decision: You made the decision, now own it. Good or bad? It does not matter because you did everything you possibly could to make the best decision for yourself. Trusting God to work good even from the not-so-good parts: This is the tricky part. Just please remember to keep your faith and stay focused on God even through out the "bad" parts of your decision. Remember there is a bigger plan at work here. This is just a piece of the puzzle. You made what you thought was the best yes, now let God do the rest. As I was reading these chapters I kept thinking of a scripture: "Faith without works is dead." I think this encompases all that these chapters speak to. We have got to do the work, learn tools and ways to decide the best yes for ourselves. THEN, have faith. Faith that God will take care of everything else.